Commercially savvy clients do not underestimate the overall value that intellectual property assets represent to their business, or the need to protect these assets against unauthorized use, especially in a climate dominated by electronic and internet communications. Members who practice in this area offer a wealth of experience in disputes relating to copyright, industrial designs, patents, trademark infringement, passing off, confidential information and trade secrets. One Silk is noted for being "an excellent advocate and a pleasure to work with and to instruct." Her "broad practice covers all key IP issues and extends across an impressive range of industry sectors." One of DVC's juniors stand out for being "seen as one of the rising stars of his seniority" and for possessing "very powerful advocacy" skills "in his own right." 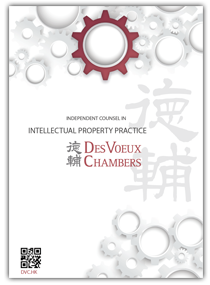 "Ling Chun Wai of Des Voux Chambers represents parties in a diverse array of commercial and administrative cases and is a seasoned pro in IP, particularly trademark, disputes."